BillHustonBlog: Bomb Trucks SHUT DOWN! 21x XNG #BombTrucks are sitting idle in Forest Lake! 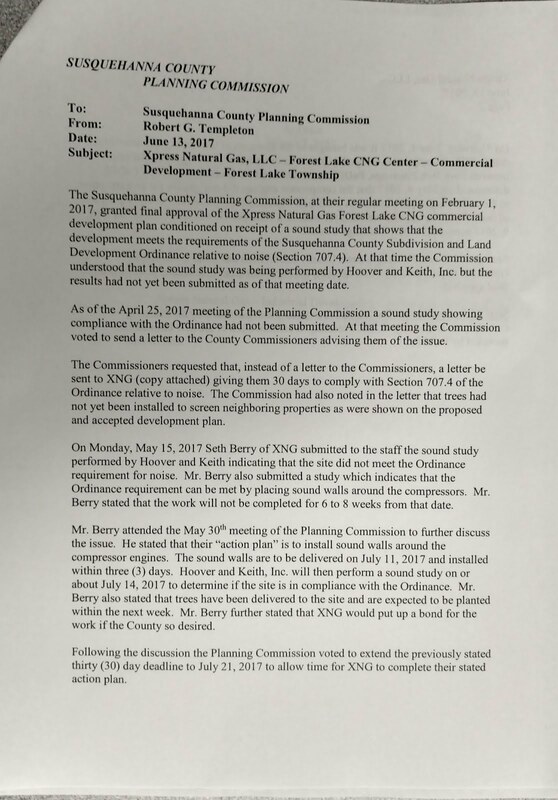 Susquehanna County Commissioners issued a Cease-and-Desist order to XNG facility at Forest Lake. 2x outbound trailers at ~6:15 and THAT'S ALL FOLKS! At 6:00, It looked all shut down. But at 9:15, it looked to be back in service. And some of the trailers are gone. One truck looks like it's ready to leave. We are trying to reach a county official for the official word. My guess is either XNG anticipated the order, and it never happened. So shortly after COB they restarted. or else the order DID happen, they shut down for a few hrs, and then decided to defy the order. Either way, they should be shut down by Monday for at least a month. Hopefully for good! We still very much need people in VESTAL to do spot checks on 440 Prentice Rd (take photos!). And we need people in OTSEGO Co to report on truck spotting... Times, where seen? How many? Normal flow? Reduced? Or Increased? And we need someone from HERKIMER Co to drive by Manheim station and report activity. (take photos!). 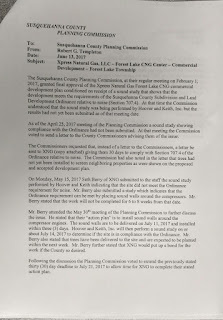 People asked for more background, why would the pro-gas Susquehanna County Commissioners go after XNG? After all they've been through. 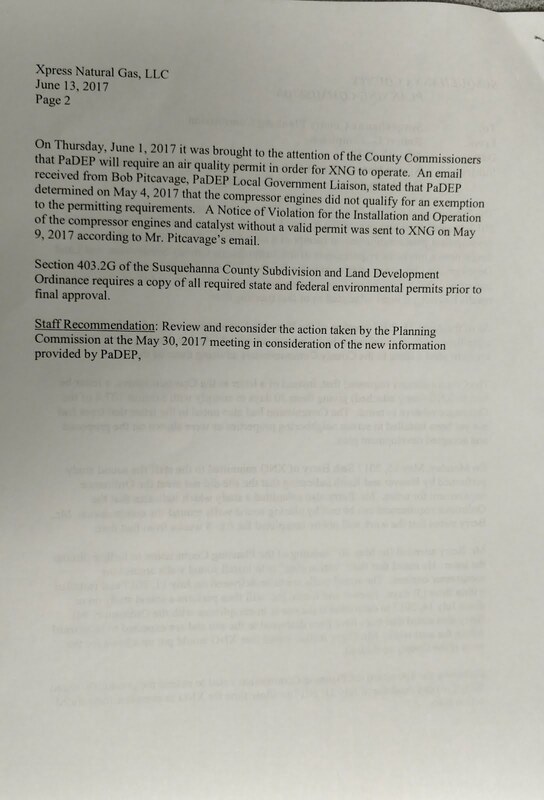 See attached memo from Susquehanna County Director of Planning Bob Templeton to the planning board. XNG is not in compliance with the Board's Conditional Final Approval. ★ not all required permits and environmental studies completed, e.g. ★operating without a FERC Certificate of Public Convenience and Necessity. Certificate of Public Convenience and Necessity. XNG has been out of compliance since they began operations in February. They have never been in compliance. The planning commission says this is very unusual. Stipulated conditions for conditional permits are normally remedied in weeks. 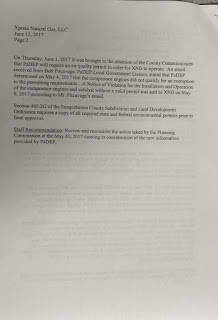 The Planning Board voted to bounce the issue back to the County Commissioners claiming the Planning Board has no enforcement authority. Maybe even Susquehanna County has reached a breaking point? Also, former county commissioner Mike Giangreco is the county soliciter is a neighbor of the facility. So there's a lot of parts to this. Lastly, as of 9pm last night, it looked like the site was back in operation. So they are either defying the order, or they anticipated the order on Fri, and it never came.